May 21, 2012–Washington, DC– This morning, an Op-Ed by DRI President Laurie Ahern was published in the Washington Post. The Op-Ed defends the actions of the Duchess of York, Sarah Ferguson, who is currently being prosecuted by the Turkish government for “acquiring footage and violating the privacy” of children in a Turkish state-run orphanage. 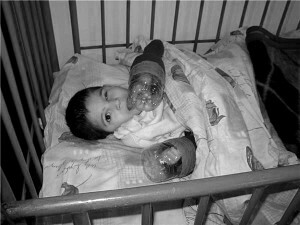 The ITV of London investigation was a follow-up to DRI’s 2005 report, “Behind Closed Doors: Human Rights Abuses in Psychiatric Facilities, Orphanages and Rehabilitation Centers in Turkey,” which documented the abusive treatment of children and adults locked away and forgotten in state facilities. Please take a moment to read Laurie’s full Op-Ed. To help DRI take advantage of this media attention and international pressure, please consider making a donation to DRI’s Worldwide Campaign to End the Institutionalization of Children. Children in Turkey, and across the world, can’t wait for more courageous individuals willing to risk their freedom to expose abuses. State governments must commit to immediately end placements of children in orphanages. Local and international funding must provide supports that allow families of children with disabilities to stay intact, and to provide safe and appropriate community alternatives to institutionalization. Every day, DRI fights for implementation of these policies, and for the realization of human rights guaranteed under the UN Convention on the Rights of Persons with Disabilities.